Professional printing and Custom Portrait Art for your home. We believe that photographs shouldn't live on your computer. Sharing the experience of looking through a photo album with family, children seeing themselves being loved in a wall portrait and remembering tiny fingers and tiny toes are what having a portrait made is all about. That's why we work with the top professional photo Labs in the industry to print your portraits and create one of a kind fine art products your family can treasure and enjoy for years to come. Your portraits are printed on Professional Photographic paper, color and quality-assured with first class finishing and mounting options. Professional Photographic Prints have a longevity of 100 years in typical display conditions and 200 years in dark storage. Not all prints are created equal. Ask in your consultation for more details and to compare prints. Gallery wrapped Art Canvasses are perfect for when you want to take an exceptional image to another level and let you turn any photo into a work of art. Group several canvasses together and create one-of-a-kind artwork for your home that can't be bought in stores. 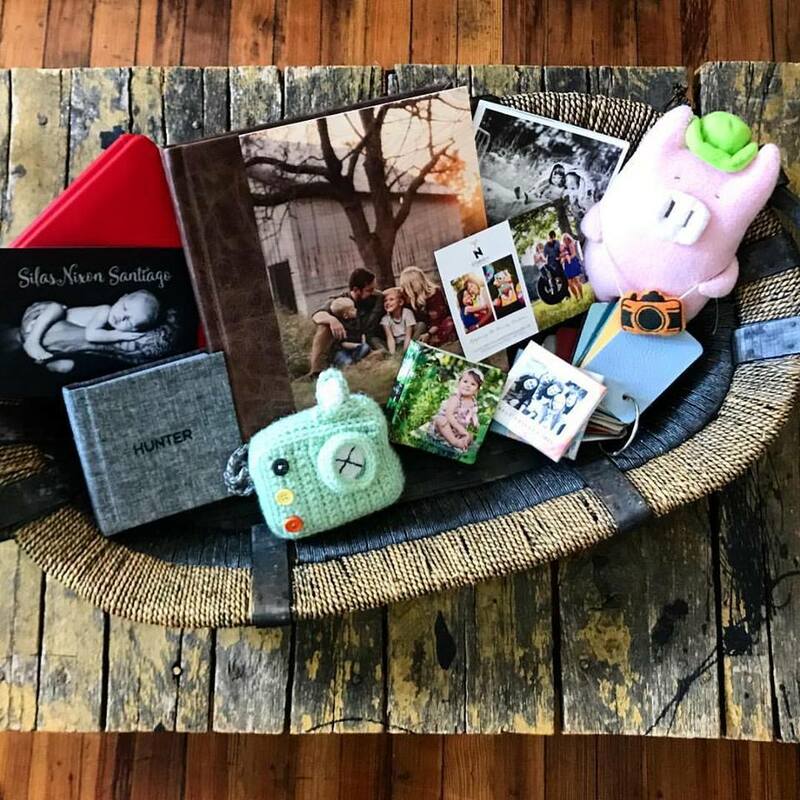 Heirloom and session albums are the perfect way to share your portraits and pass them along for generations to come. Your images are expertly curated and laid out into a one of a kind album with the cover of your choice. Images are printed on photographic paper, mounted and bound into a beautiful archival heirloom book. Choose between the leather and linen covers or upgrade to a custom photo, metal or wood cover. Visit the studio to hold one of the beauties in person! Order one or two companion albums to keep and share when the kids move out and want a copy of their own or to share with grandparents. Your prints will be texturized, sprayed with a lustre coating, mounted onto masonite and framed without glass. Choose from our basic line of frames or upgrade to one of our specialty frames to perfectly match your style and home. While we highly encourage our clients to have their images professionally printed through the studio, we do understand the need and want for digital files also. We offer options to purchase single, groups or all of the digital files from your session including reprinting rights and a 4x6 comparison print. Files can be delivered via digital download or USB and basic tips are included on storage, backup and where to print. Creative session fees start at $175. This fee does not include prints, products or digital files but does include your session consultation, professionally edited and finished images, your viewing and ordering session as well as expert advice on decorating your home with portraits. After your session you can purchase al-a-carte prints starting at $50 and print collections start at $475 and go up. There is a $200 minimum print order after the session fee and most of our clients spend in the range of $850-$1500 per session with many spending more for Canvas Wall Art, Heirloom Albums and upgraded framing. If you are interested in only a few 5x7s or 8x10s, a full custom portrait session may not be the best fit for your family. A few times a year we do offer specialty sessions that are shorter, on specific days and times at a specific location with a lower pricepoint and smaller packages. Subscribe for more details and check out the blog as well. I'd be happy to walk you through the full pricing guide for your session. Give us a call or shoot over an email and we will discuss the appropriate pricing guide based on the type of session you would like to schedule!